I love clams. My earliest memory of them was eating them drenched in black bean sauce on Lamma Island off Hong Kong; meaty ones, without a hint of grit. Huge platters were bought to the table for you to feast on, and I had eyes only for them. Well, them and the buckets of prawns fried with garlic. I would squirm on my sweaty plastic chair, the sea breeze cooling us, grabbing at more clam shells and greedily scooping out its contents. It wasn't a pretty sight. Unfortunately I don't often see clams on sale much, so when I did I took the opportunity to grab a bag of them. My eyes widened when I saw that they cost £20 (Waitrose for you), but as a treat I swallowed my gasp. You can use mussels for this though, if they're too difficult to get hold of, or too pricy. Black bean is a strong flavour, but one that still allows the sweetness of the clams to shine through nicely. Eaten on top of some steamed white rice to absorb the juices, this was one to tackle with your hands, clattering away at the table. 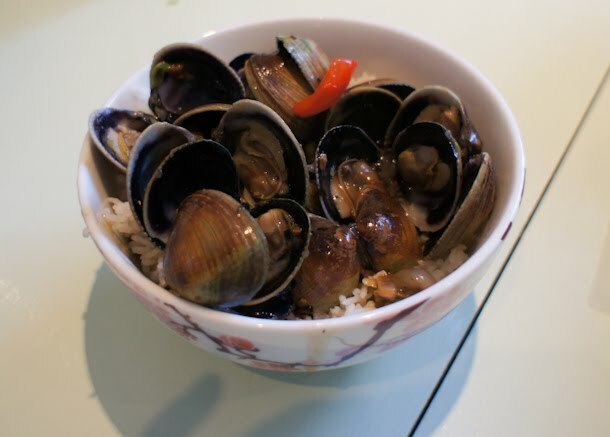 I served this with some simply steamed greens; the clams were made short work of, and we had the bonus of some flavoursome rice afterwards. Steamed white rice to serve. Rinse the clams under running water for a good 15 minutes. Leave to drain. Meanwhile, smash up the black beans in a pestle and mortar with the garlic and minced ginger. Heat up some oil in a wok, and then fry the ginger, garlic and black beans gently. Add the red pepper, and fry gently until softened. Add the water, and bring to a simmer. Add the clams followed by the soy sauces, vinegar, rice wine and sugar. Put the lid on and steam for a couple of minutes (I used foil) and then add the cornflour and toss well. 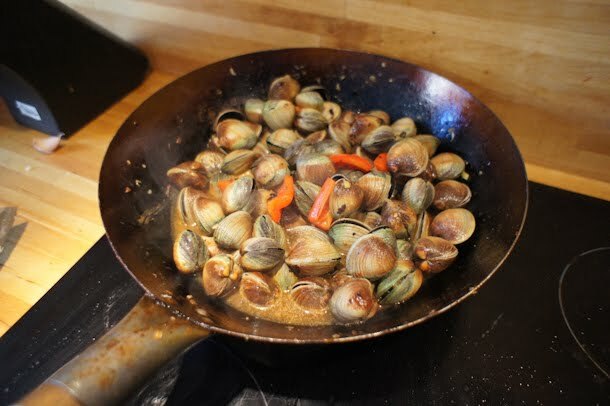 The clams should now be open and cooked, but if not just carry on tossing them around the pan until they do on a medium heat. 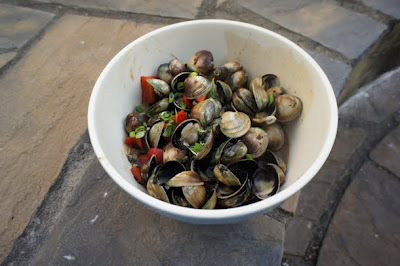 The sauce should be glossy and should cling to the clams, if not you need a little more cornflour mixed with water, cooked into the sauce. Serve in a big bowl, garnished with the spring onion, with rice on the side. These sound worth splurging on another bagful I must say! Sounds like an interesting mix of flavours - will give it a go. £20 though? Crumbs. What was the weight? Did you manage to get all the grit out of the clams? That can be a right pain in the arse from memory. These look great though.